voussoirs: WHY BOTHER WITH TOWN PLANS? WHY BOTHER WITH TOWN PLANS? The question, 'Why bother with Town Plans?' 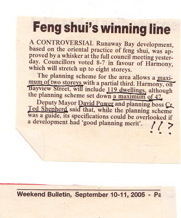 must be asked after again reading this clipping from Weekend Bulletin, September 10-11, 2005. 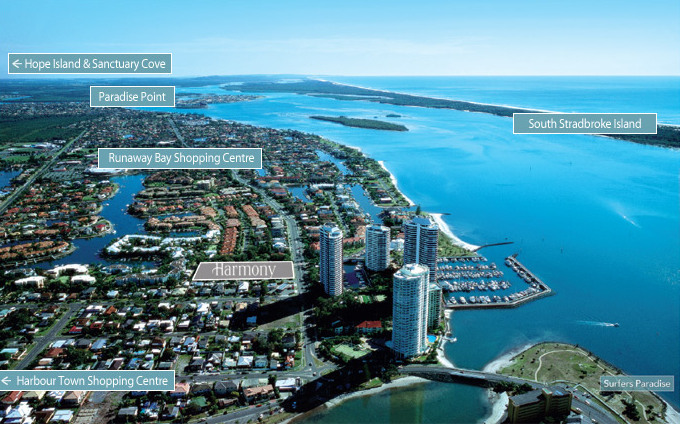 A controversial Runaway Bay development based on the oriental practice of feng shui, was approved by a whisker at the full council meeting yesterday. Councillors voted 8-7 in favour of Harmony, which will stretch up to eight stories. The planning scheme for the area allows a maximum of two stories with a partial third. 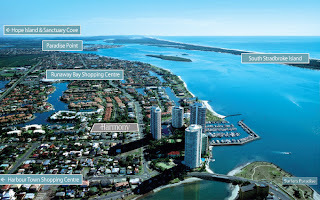 Harmony, 23 Bayview Street, will include 119 dwellings, although the planning scheme set down a maximum of 42. Deputy Mayor David Power and planning boss Cr Ted Shepherd said that, while the planning scheme was a guide, its specifications could be overlooked if a development had ‘good planning merit’. It is an old report from September 2005, but it is worth noting here in October 2012 because nothing seems to have changed. Unless Town Plans are written carefully and implemented with rigour, they are just a waste of time, leaving our towns and cities open to the whims of developers, and those of our Councillors. Why should one bother? Well, just look at the shadows cast by the tall buildings and ponder the impacts on amenity in the area, if nothing else! The other point is that Councillors and developers come and go, but the outcomes of their decisions remain with us for many years after they have lost power, and establish precedents that stimulate further development and geater difference. Town Plans should offer a clearly defined vision and be strictly implemented so that futures can be properly controlled, feng shui or not. PAIRS 7 - CALL THEM CACTUS?